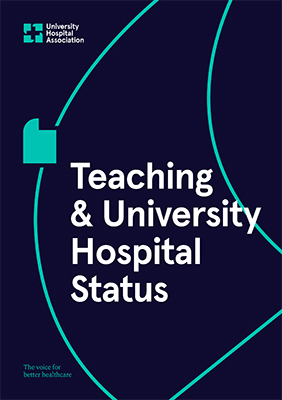 This document defines status of ‘university hospital’, focusing on the commitment that university hospitals must make to teaching and research. It highlights the importance for trusts in demonstrating this close working relationship through collaboration in research activity and ensuring university representation on relevant trust committees, as well as delivering high-quality clinical education for health profession students. A guide featuring several case studies from the UK’s leading research and teaching NHS Trusts. The case studies describe best practice strategies employed by the Trusts to improve nurse retention. Strategies range from facilitating staff engagement to fostering a culture of recognition and reward. Research SPA Position PaperGuidelines on the allocation of programmed activities for research in NHS trusts. These were produced by the UHA (formerly Association of UK University Hospitals, AUKUH), R&D Director group in conjunction with the Medical Directors group and approved by the Chief Executives at their meeting in May 2015. The University Hospital Association, the Medical Schools Council, the Dental Schools Council and the Higher Education Occupational Physicians Group have published guidance on Blood Borne Viruses. This guidance is intended for use by medical and dental schools, medical and dental students, occupational health services and health provider organisations. This document demonstrates the hierarchy of responsible officer connections in the new English NHS architecture.